Due to the increasing demand for improved environmental and safety control, Walker Filtration have compiled from its standard filter products a complete range of wall and floor mounted breathable air products that are specially designed to suit two and four port breathing air installations. Carefully researched and tested to ensure high levels of performance and integrity, these breathable air products can be installed where clean compressed air is required. 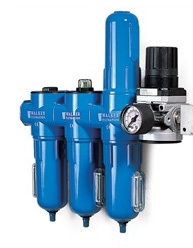 The Walker Filtration range of filter packages offer filtration and oil removal efficiencies down to 0.01 micron and maximum oil removal to 0.003 mg/m³ (0.003 ppm). This ensures that the operator has clean, particle and liquid oil free air with the added benefit of taste and odour removal for improved user comfort and performance.